Do you remember him in these holiday classics? Or maybe you recall him from Disney? * Tootsie Roll Pops, in this 1969 commercial: How many licks does it take, Mr. Fox? Maybe you remember him as the narrator of "Stan Freberg Presents The United States of America" (1961)? Or from (just a few of) his other performances? * "Knight Rider," as K.A.R.R. Perhaps you heard him in "George of the Jungle" (1967), as the narrator (7:15 and on; and as Ape, and multiple other characters), "The Atom Ant/Secret Squirrel Show" (1965), as Morocco Mole, or in "Francis in the Haunted House" (1956), playing Francis the Talking Mule (1:10)? Or maybe, and finally, you remember the Jay Ward favorite's star turn in "The Rocky and Bullwinkle Show" as the narrator for Dudley Do-Right and -- of course and always -- as Pottsylvania's favorite son, Boris Badenov. If you're interested in knowing more about Frees, a fuller list of his work is available here. Even more fun facts. A letter from a friend. 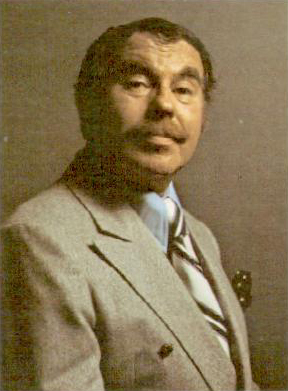 He was also the subject of a biography, "Welcome Foolish Mortals...The Life and Voices of Paul Frees." In memory of Paul Frees (June 22, 1920 - November 2, 1986), the original Man of a Thousand Voices. But especially for Boris. Always Boris. That voice...where have I heard that voice? Boris Badenov and Burgermeister Meisterburger? Well of course I should have known they were the same guy! Also, that "Momma Told Me not to Come" cover is bizarre. Another interesting fact about Paul Frees is that Elvis Presley arranged his famous meeting with Richard Nixon to get a narcotics agent badge, because he was jealous of Paul Frees' badge. He also voiced Captain Peter "Wrongway" Peachfuzz. Pretty much the voice of my childhood, along with June Foray and Daws Butler. There's also his album, Paul Frees and the Poster People, which is a collection of contemporary "now sound" hits from 1970 sung in the voices of Bela Lugosi, W.C. Fields, and other old movie stars. A very early appearance was his Peter Lorre imitation (starting at 1:30) on Spike Jones' rendition of "My Old Flame." It doesn't hold a weird, racist candle to his version of Let It Be as sung by Charlie Chan. I've heard him doing a "voice on the radio" in more than one MST3K movie. Amazing post. Wonderful to learn more about Paul Frees. Thank you MonkeyToes. Thanks to him I can never say "moose", "squirrel" or "moose and squirrel" in my normal voice. I just can't. I just hope I never have a job interview where those words might come up. That's where I mostly remember him. God, what a great album. Here's another, later, photograph of Paul Frees. Until this post, I don't think I can recall ever seeing a picture of him, but his voice was unforgettable, even when it was buried under some character. Ha, we just watched Santa Claus is Coming to Town the other night, and it makes perfect sense that Burgermeister Meisterburger (such a great character) is Boris Badenov, just German instead of Russian. I love it when he trips up on those Ghost Host sessions: "The happy haunts are received a faldric namjitch..."
Related, there is a nice video interview with June Foray and Bill Scott (Rocky/Bullwinkle and Nell Fenwick/Dudley Do-Right, among other characters) here. I just watched the KARR episodes of Knight Rider on Netflix last week. The 80s were a magical time. He was also the opening narrator and played the role of an on-site reporter in The War of the Worlds. Throw in Mel Blanc and Don Messick and ya got yourself a full house! It always blew me away that Frees did the voices of Boris Badenov AND Poppin' Fresh the Pillsbury Doughboy. The vocal range that required! I still have a vinyl copy of his "Poster People" album, and to offer an inadequate excuse, the racist version of "Let It Be" was him doing "Warner Oland in the character of Charlie Chan". Oland (and a couple other actors) were Caucasians doing the "great Oriental detective" in the original movies (although some young Chinese actors got their first breaks as his sons). It was classic Hollywood racism, and Frees, who did all kinds of dialects, couldn't find a famous enough real Chinese actor to imitate. It always was a funny trope in Rocky & Bullwinkle that Boris Badenov, with his Russian dialect, reported to Fearless Leader, with a German dialect. Of course Frees narrated the movie version of "War of the Worlds". His most demanded celebrity voice was that of Orson Welles (not included in the "Poster People" album because he was limiting himself to dead celebrities and Orson was still alive and kicking... and complaining whenever Frees did his voice). Also of note, after Frees' passing, the go-to-guy for Orson Wellesian voicing is Maurice LaMarche, and yes, his "Brain" on Pinky and the Brain is 99% Welles. Yes, exactly! But it had not occurred to me. I've known "that guy's" voice for so long, and yet never put it together, never knew the name and work behind the characters. This post came together because I heard "Mr. Magoo's Christmas Carol" and "Stan Freberg Presents the United States of America" within a short span of time, and then saw that scene in "The Wire" where a reticent Ukrainian complains that Americans call him Boris, always Boris. A memory of "Rocky and Bullwinkle," even now, out of Baltimore. So I went looking, and I'm delighted to finally put a name and a face to "that voice." Great post! Paul Frees maybe hasn't gotten quite as much attention over the years as Foray, Blanc or Butler, but he was a terrific talent who was just as versatile as his better known peers. Regarding the re-purposing of celebrity impressions as cartoon voices, IIRC, Frees' Morocco Mole was basically a version of Peter Lorre, similar to the way Maurice LaMarche's voice for the Brain is derived from Orson Welles. As Longtime Listener points out, Frees had had that voice in his bag o' tricks for many years. Boris Badenov taught me English! This countdown is one of my ringtones, though I've never seen the show ever. He got a great cadence going, there! Maurice LaMarche's voice for the Brain is derived from Orson Welles. He also provided the speaking AND singing voice of Meowrice in UPA's 1960's animated feature "Gay Purr-ee..."
Thank you for this amazing post on such a versatile voice! I never put together that he was both Burgermeister and Frosty's Santa (a much more loveable Santa than judgy Rudolph-Santa) AND Jack Frost. And for years whenever loved ones get grumpy about Christmas I'd trot out the Burgermeister's "A Yo-YO?" to cheer them up. I'm forwarding this to about 18 people now. No thread on Boris Badenov is complete without a link to Akim Tamiroff, who was the inspiration for Boris' voice. I saw "The Great McGinty" only a couple months ago, and he was terrific! And who could forget him in "Touch of Evil."